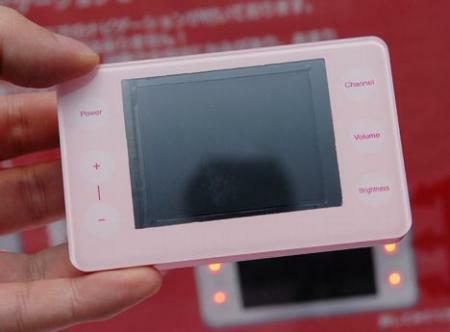 Takara-Tomy have announced a new portable TV with one very interesting feature: it comes complete with its very own nagging character, who starts off chiding you for changing channels too often, and suggesting grumpily that the screen’s too bright, before becoming more friendly over time the more you use it. In the realm of “odd things to add to a gadget”, this must surely be king, but Takara-Tomy reckon they’ve hit on a great idea, and intend to release other TVs with characters with different personalities. It’s a novel idea, and certainly makes your average gadget a but more fun, though of course the novelty may quickly wear off if there’s only a small range of comments. Being chastised tends not to be much fun in general, but getting the same nagging comment every time you change channel would be really annoying. The TV itself features a small 3″ QVGA TFT screen, receives One-Seg DMB TV signals, and can run on alkaline batteries, which are good for 4 hours of continuous use. One other neat feature is the ability to record your favourite programme onto a microSD card for later viewing, or use in some other similiarly-equipped media gadget. Should be released in Autumn 2007, in Japan only worse luck, for about $200.